Saudi Aramco acts as a catalyst to stimulate new opportunities in the kingdom and across the world. By bringing people and organisations together, Saudi Aramco accelerates the development of new ideas, creating additional value from everything it does. This is a far-reaching aspiration and one that touches upon nearly every aspect of its business. The growth of its global chemicals business, for example, will introduce new product streams, and from them, the ability to manufacture new products that will generate opportunities for a wide variety of businesses. The kingdom’s economy will become more diverse, triggering new employment and entrepreneurship opportunities for Saudis. By being a catalyst for the development of a Saudi energy services sector, Saudi Aramco is laying the foundation for greater rewards for both its industry and the kingdom as a whole. The company is supporting the local development of businesses that manufacture energy industry materials and provide engineering and oil field services. These initiatives will help establish the kingdom as a strategic hub for energy service sector investment, both locally and internationally, says Saudi Aramco in its 2014 Annual Review. Facilitating a sustainable future also means fostering a healthy domestic energy ecosystem in the kingdom. Many of its activities – from testing renewable energy options to promoting a culture of conservation and efficiency – are directed to enabling an energy efficient national economy with a more diversified energy mix. At Saudi Aramco, its mission is twofold: actively advance the commercial sustainability of its company, and through the work it does, seek opportunities to contribute to the growing prosperity of the kingdom it serves and the world everyone inhabits. In 2014, Saudi Aramco enabled a more sustainable future in numerous ways. It continually looks for ways to amplify the benefits of its business activities. In a pioneering collaboration with General Electric (GE) and Tata Consultancy Services, Saudi Aramco established a new Business Process Service Centre designed to create nearly 3,000 jobs for Saudi women within the next three years. Tata Consultancy Services, a world leader in business process services, will operate the centre. The centre, located in Riyadh, is the first all-female business service centre in the kingdom. The centre already has more than 400 full-time female employees providing business support to many of its company departments – and to GE – in the fields of finance and accounting, supply chain management, and human resources. The centre is providing business services to GE customers in 39 countries throughout the Middle East, Africa, and Europe. By outsourcing these services, companies are able to focus on their core activities while helping to create quality and sustainable employment opportunities for women in Saudi Arabia. Saudi Aramco partnered with Princess Nourah Bint Abdulrahman University in Riyadh to develop the concept of a Women’s Business Park located on the university campus. A Memorandum of Understanding was signed to conduct a feasibility study and create a conceptual master plan for the new business park. The university has allocated a number of dormitory buildings for use in early-stage testing of the concept. The business park is envisioned as a bridge between academia and the workplace. Students and graduates of the university will have first choice to train and work in all-female services-based companies located in the business park. The Tata Consultancy Business Process Service Centre will be relocated to the business park as an anchor tenant. The Women’s Business Park is anticipated to create 10,000 to 15,000 jobs for Saudi women. Through its European sales and marketing affiliate, Saudi Petroleum Overseas Ltd. (SPOL), and with its partners the Saudi Arabian General Investment Authority and Euromoney, Saudi Aramco sponsored the firstever Saudi-UK Investment Forum. The forum showcased foreign direct investment opportunities that meet the kingdom’s objectives of boosting domestic productivity, creating high-quality jobs, and increasing overall prosperity through a strong, diversified economy. Topics addressed at the forum included investor climate and business opportunities in healthcare, logistics, and technology and innovation. Enabling economic diversification Economic diversification is an important success factor for any economy seeking long-term sustainability. Saudi Aramco is doing its part to establish businesses that propagate diversification. Several industrial parks and other initiatives associated with its integrated refinery and chemicals facilities offer foreign and local investors opportunities to take advantage of the kingdom’s competitive labour costs, logistics capabilities, lower energy costs, and proximity to the growing markets of the Middle East and North Africa. These ventures create prime conditions for creating jobs for Saudis in industries that will help diversify the economy. Saudi Aramco made substantial progress in achieving its vision to attract local and foreign investment in businesses that will diversify the kingdom’s economy by manufacturing products from its chemical streams. By the end of 2014, agreements had been reached with tenants for 30 of the 34 sites in its PetroRabigh PlusTech Park and potential tenants have been identified for the remaining sites. About 30 per cent of PetroRabigh’s polymers production is slated for the park’s tenants. By 2015, it is expected that investments of up to $1.2 billion will have been made in the PlusTech Park and 2,000 new direct jobs will have been created. Promotion, marketing, and construction of the park, for which Saudi Aramco and Sumitomo Chemical are jointly responsible, will continue until all 34 park tenants begin construction of their plastic manufacturing facilities, at which time these activities will be transferred to PetroRabigh. Sadara and its adjoining value park, PlasChem Park, will deliver a full range of value-added performance products destined for the markets of the Asia Pacific, the Middle East, Eastern Europe, and Africa. By the second half of 2015, Sadara is expected to begin producing plastic and chemical products that companies can use to make plastic products, detergents, and foam materials for domestic and international markets. Sadara’s integration with PlasChem Park is a prime example of how Saudi Aramco is advancing Saudi Arabia’s strategy to become a hub for future downstream industrialisation of chemicals and plastics. PlasChem Park on its own will create more than 20,000 high-quality jobs, either directly or indirectly, for Saudi nationals. Saudi Aramco has been entrusted by the government to develop Jazan Economic City. Located in a coastal region known for its abundant natural resources and covering an area of 106 sq km, the economic city will be a hub for a diverse platform of heavy, medium, and light industries. Phase 1 of the project, which will be completed in 2017, focuses on building smart infrastructure that meets the energy, utilities, and transportation requirements of a wide array of industries. These infrastructure investments will be complemented by several large-scale national projects including a new Jazan airport and a 660-km Jazan-Jiddah coastal railway. The city’s infrastructure development is designed to minimise investors’ start up time so they can begin operations as quickly as possible. The project is expected to substantially augment the economic output of the region and create 15,000 jobs in its first five years and rapidly scale up to generate more than 70,000 new jobs over a 15-year period. Similar to the approaches to increase local content undertaken in global energy hubs such as the US, Norway, and Brazil, Saudi Aramco is working to establish domestic suppliers of all of the goods and services relating to energy sector activity within Saudi Arabia. The company’s goals address job creation and the growth of local manufacturing and services capabilities. Saudi Aramco is putting substantial financial resources toward meeting these goals. Saudi Aramco aims to increase its proportion of in-kingdom spending in this sector from 35 per cent to 70 per cent over the next decade. The company believes this shift has the potential to create between 400,000 and 500,000 direct and indirect jobs in the kingdom in the process. In 2014, Saudi Aramco completed the transfer of the entire fleet of 20 tankers from Vela, its former shipping subsidiary, to the National Shipping Company of Saudi Arabia (Bahri). In addition, all vessel-based crews, all shore-based personnel, and Vela’s operation systems have been integrated under Bahri’s new organisational structure. 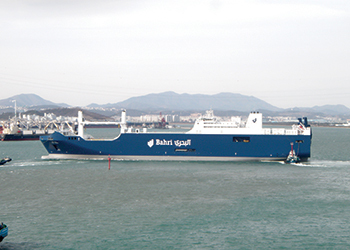 The transfer of Vela’s fleet resulted in a 20 per cent shareholding interest by Saudi Aramco Development Company (a wholly-owned subsidiary of Saudi Aramco) in Bahri. The transaction resulted in the formation of the third largest Very Large Crude Carrier (VLCC) owner in the world and Bahri is now the exclusive provider of VLCC shipping services for crude oil sold by Saudi Aramco on a delivered basis. By divesting its shipping business, Saudi Aramco is strengthening the capability of the kingdom’s domestic energy sector, creating efficiencies of scale, and enabling new opportunities for growth in the shipping industry. The Ras Al-Khair maritime yard is a prime example of how Saudi Aramco plans to energise the localisation of energy sector industries through the creation of "anchor projects" around which entire supply chain ecosystems can develop and grow. Its maritime yard initiative will result in a world-class shipyard and supporting ecosystem in Saudi Arabia. By leveraging its considerable spending on engineering, procurement, and construction, Saudi Aramco anticipates attracting qualified partners and their supply chain of vendors and manufacturers. In 2014, Saudi Aramco signed a Memorandum of Understanding with the King Abdulaziz University for the purpose of coordinating its efforts to promote the education of students in disciplines related to the marine industry in Saudi Arabia. Saudi Aramco is evaluating other potential sectors, including drilling and oil field services, to localise production and create domestic supply chains. These new businesses, allied with technology centres to spur innovation and foster development of advanced materials and processes, will contribute to greater economic diversity and drive job creation. To meet the employment needs of the kingdom’s growing population, estimates forecast that roughly 5.2 million jobs will need to be created by 2040. The private sector is where the bulk of these new jobs will need to be generated. The company’s strategy to expand its downstream businesses helps address this challenge by spurring the creation of thousands of direct employment opportunities. Indirect jobs in support of its downstream activities will number in the tens of thousands. To further stimulate growth in the private sector, Saudi Aramco is enabling entrepreneurship in the kingdom. Small- to medium-size enterprises create new jobs and generate economic expansion and this sector is a focus for its support, in particular local businesses that support its operations. Saudi Aramco is also offering venture capital and technical support to energy and chemical startups aligned with achieving its business objectives. The company’s Aramco Entrepreneurship Centre (AEC) continued to focus on giving Saudi entrepreneurs access to the resources and expertise they need to allow great ideas to flourish. In 2014, AEC screened 719 applications submitted by entrepreneurs and conducted 230 interviews with the authors of the most solid proposals. Training sessions on entrepreneurship development and business plan formulation were provided to more than 500 trainees in Dhahran, Riyadh, and Jiddah. Eighteen loans and four venture capital equity investments were approved. Since its inception, AEC has approved 38 loans and 14 venture capital investments and more than 1,200 young men and women have been trained and coached on entrepreneurship development. By creating opportunities for Saudi entrepreneurs to build the leading companies of tomorrow, Saudi Aramco fosters healthy economic growth in its communities. Ventures funded by AEC are expected to create hundreds of high-calibre jobs in the Saudi market. Along with job creation and revenue generation, these ventures will provide lasting socio-economic benefits in the form of a culture with a commercial mindset that appreciates and understands the value of entrepreneurship and risk-taking. Saudi Aramco has a vested interest in managing the kingdom’s resources in a sustainable way. Managing these resources wisely for the generations to come and capturing more of their value is at the core of its long-term commitment to building a sustainable energy economy and delivering the foundation for a prosperous tomorrow. When Saudi Aramco talks about enabling energy sustainability, it means optimising all of the practices and technologies used in the discovery, recovery, processing, distribution, and end-use of its energy resources. It means actively promoting and supporting a shift to an energy efficiency culture both within its company and kingdom-wide. Saudi Aramco made significant progress in 2014 to achieve higher levels of energy sustainability. There is much more it intends to do. And by doing so, the company set the example for others to follow. The Power & Water Integrated National Plan provides for a comprehensive assessment of the kingdom’s water and energy infrastructure and a long-range demand forecast to enhance future utility planning. The plan is guided by an integrated coalition of government ministries and leading kingdom businesses for whom judicious energy and water use are of the utmost importance. The study will, for the first time in the kingdom, include a human behaviour analysis of domestic water and power consumption. Per capita energy consumption in Saudi Arabia is roughly double the world average. Left unchecked, rising demand for energy has the potential to negatively impact domestic economic growth. Saudi Aramco is committed to the energy efficiency drive pioneered by the Saudi Energy Efficiency Programme, a subcommittee of the Saudi Energy Efficiency Centre (SEEC), which has been tasked with the establishment of a comprehensive national programme to rationalise energy consumption. Saudi Aramco takes a comprehensive approach to promoting change, working with both the public and private sectors to optimise the kingdom’s energy efficiency. Together, Saudi Aramco is changing how the kingdom consumes energy to help ensure continued prosperity for future generations. Saudi Aramco continuously works to advance energy efficiency. It conducts ongoing measurement and calibration of its own energy usage, implement energy-saving technologies, promote education and awareness, and seek innovative solutions. The first annual insulation forum, held in Riyadh in October 2014 and hosted by SEEC, was a landmark event in the kingdom’s energy efficiency efforts. The forum marked the activation of new standards related to thermal insulation for residential buildings in 23 major cities in Saudi Arabia. As a lead sponsor of the forum, Saudi Aramco announced its goal of saving 35 per cent of its total energy use in buildings, transportation, and communities by 2020. The company’s goal is to reduce the energy use per square metre in its existing buildings from 500 to 310 EUI (energy use intensity) and from 425 to 250 EUI in new buildings. For existing community homes, Saudi Aramco plans to reduce energy use per square meter from 300 to 160 EUI and from 240 to 120 EUI in new home builds. The company’s plan to achieve its overall energy efficiency goals includes the replacement of conventional lighting with high-efficiency LED lights, installing "smart" energy meters in homes, switching to more efficient air conditioning systems, and upgrading external insulation. Reducing energy demand is a key component in any energy efficiency drive. In Saudi Arabia, air conditioning consumes a high percentage of electricity. Lowering demand in this one area will create significant energy savings. Part of its approach is to encourage change in everyday energy usage by helping citizens realise the positive impact they can make. For example, in 2014, the Energy Efficiency Pavilion – part of its iThra Knowledge programme – toured the kingdom, raising awareness about energy efficiency and wise energy choices. 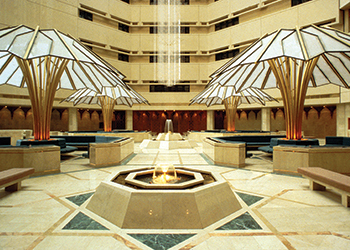 The pavilion is a joint initiative between Saudi Aramco and the SEEC. More than 2 million people visited the iThra Knowledge programme in four cities in 2013–2014 and at least 70 per cent of them visited the Energy Efficiency Pavilion. The effectiveness of the pavilion’s impact on behaviour change is under study. By reallocating sales gas from older, inefficient plants to newer, efficient ones, Saudi Aramco saw a significant fuel savings in the utility sector. This, combined with the introduction of opportunity fuels into the kingdom’s utility fuel mix (low-Btu gas and petroleum coke, for example), Saudi Aramco intends to increase utility sector efficiency from 32 per cent in 2014 to 45 per cent and eliminate the use of diesel for power generation altogether by 2030. Saudi Aramco collaborated with the kingdom’s major utility sector stakeholders to devise and issue a 10-year, integrated utility expansion plan. This Utility Fuel Mix Optimisation Project, approved by the Ministry of Petroleum and Mineral Resources, calls for the introduction of 30 gigawatts of natural gas combined cycle plants. This action alone will raise the sector’s fuel efficiency from 33.5 per cent to 40 per cent by 2023. In just one example of its efforts to increase energy efficiency in its operations, Saudi Aramco reduced its refining energy intensity by 3 per cent in 2014, primarily as the result of energy conservation initiatives. Self-sufficiency in generating electricity to power its operating plants through cogeneration is an important component of its energy strategy. Cogeneration allows it to produce electricity as a natural byproduct of its operations, enables it to work without drawing on the national grid, and ensures business continuation in the event of utility grid interruptions. Saudi Aramco achieved a significant milestone in its cogeneration aspirations in 2014, reaching roughly 90 per cent self-sufficiency in power generation. Saudi Aramco commissioned its 420-megawatt cogeneration plant at Manifa, making the facility self-sufficient in power generation. Through its joint venture with the Power Cogeneration Project Company, pre-construction work began on new cogeneration plants at its Abqaiq, Hawiyah, and Ras Tanura facilities. In pursuit of greater energy efficiency across the kingdom, Saudi Aramco is partnering with the Saudi Electricity Company (SEC) on a number of significant projects. 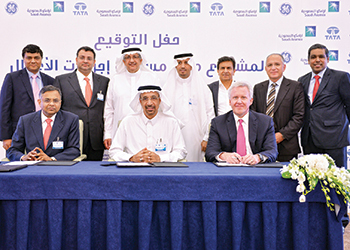 On July 21, 2014, Saudi Aramco signed a Transmission Use of System agreement with the SEC. The agreement is one of the key steps to restructure the kingdom’s electricity sector and promote efficient power generation as envisioned under the kingdom’s electricity law. The agreement allows it to move power from its highly efficient cogeneration facilities to its demand centres on the SEC’s electricity transmission network. Saudi Aramco see great value in the potential of renewable energy sources to help meet the kingdom’s growing power demand. Saudi Aramco is studying and testing several targeted renewable energy technologies to promote a national renewables agenda with a focus on solar and wind. In 2014, Saudi Aramco signed a Memorandum of Understanding with the SEC to establish a joint venture for the deployment of these and other renewable energy projects to displace the use of high-value liquids. Saudi Aramco is investigating the possibility of introducing 300 megawatts of solar photovoltaic and wind energy projects at 10 remote locations in the kingdom to displace 3,300 bpd of diesel power generation. It is exploring upgrades to its Dhahran solar test field to improve data collection systems. It also plans to conduct accelerated degradation and temperature performance testing in third-party laboratories and collaborating with Kaust on module and electronics testing. The company’s feasibility study of wind power development continued to progress in 2014. Saudi Aramco plans to install a 3.3 megawatt wind turbine at its Turaif bulk plant. The objectives of this demonstration project are to reduce fuel consumption at the bulk plant and build operational capabilities in preparation for additional wind turbines.